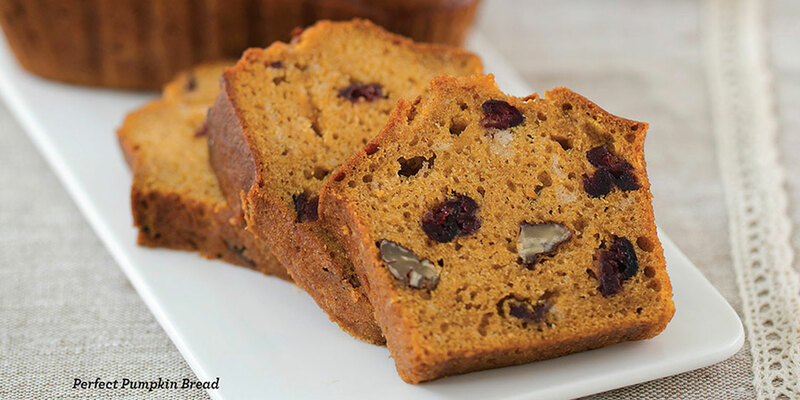 No mixer needed for these pumpkin loaves. Recipe from The Calories In, Calories Out Cookbook: 200 Everyday Recipes That Take the Guesswork Out of Counting Calories—Plus , the Exercise It Takes to Burn Them Off, © Catherine Jones and Elaine Trujillo, 2014. Reprinted by permission of the publisher, The Experiment. Available wherever books are sold. Makes 2 large loaves or 5 small loaves; each large loaf serves 12, each small loaf serves 5. Center an oven rack and preheat the oven to 375°F (190°C). Spray two 8½ x 4½ x 2½-inch (21.5 x 11 x 6 cm) or five 5¾ x 3 x 2⅛-inch (14.5 x 7.5 x 5 cm) loaf pans with cooking spray; set aside. In a large bowl, combine all the dry ingredients and whisk until well blended; set aside. In another large bowl, combine the canola oil, applesauce, eggs, egg whites, and water and whisk to mix. Add to the dry ingredients and mix until combined. Add the pumpkin and the cranberries and walnuts, if using, and mix until well combined. Divide the batter evenly among the prepared loaf pans. Bake for about 70 minutes for large loaves, about 40 minutes for smaller loaves, or until a cake tester inserted in the center comes out clean. If the loaves are browning too quickly on top, cover them loosely with a piece of foil. Let sit for 5 minutes, then remove from the pans and cool completely before slicing. To freeze, wrap the cooled loaves in aluminum foil and freeze for up to 1 month. Store leftovers in an airtight container in a cool, dry place for up to 3 days.